DELTA LYRAE A nice pair of stars more easily separated with the naked eye than the Epsilon pair. the stars of Delta are 12 minutes of arc apart ( which is about 1/3 the diameter of the Moon's disc). 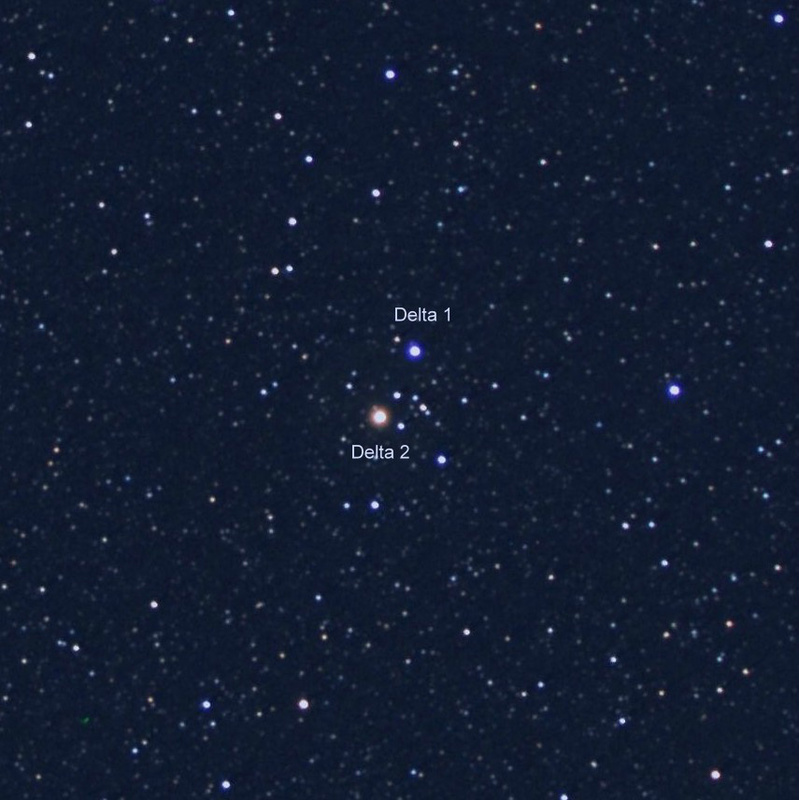 Delta 1, at magnitude 5.5, is bluish in colour, while its component, Delta 2, is slightly brighter at visual magnitude 4.5, and has a reddish tint. So, here we have a pair with contasting colours. Although, with the naked eye, the colour contast cannot be detected due to the faintness of the components: With binoculars or small telecope the contast is beautiful to see. There are many faint stars in the field hereabouts, which may possibly constitute an open cluster of stars. 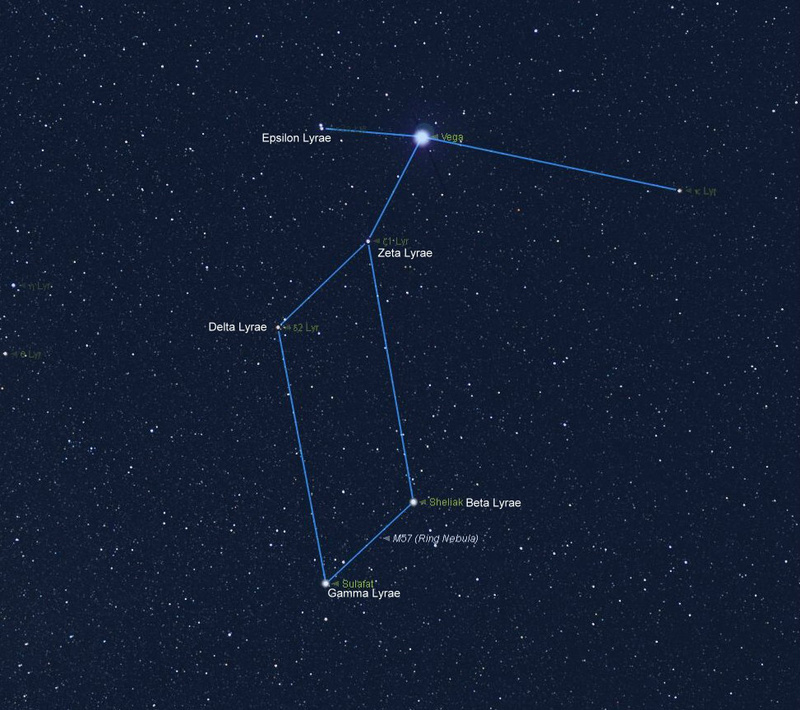 ZETA LYRAE. This is another lovely contrasting pair, but much closer than Delta. (44 arc seconds). You need a telescope to see the colour contrast clearly. Zeta A, the brighter component is reddish, of magnitude 4. 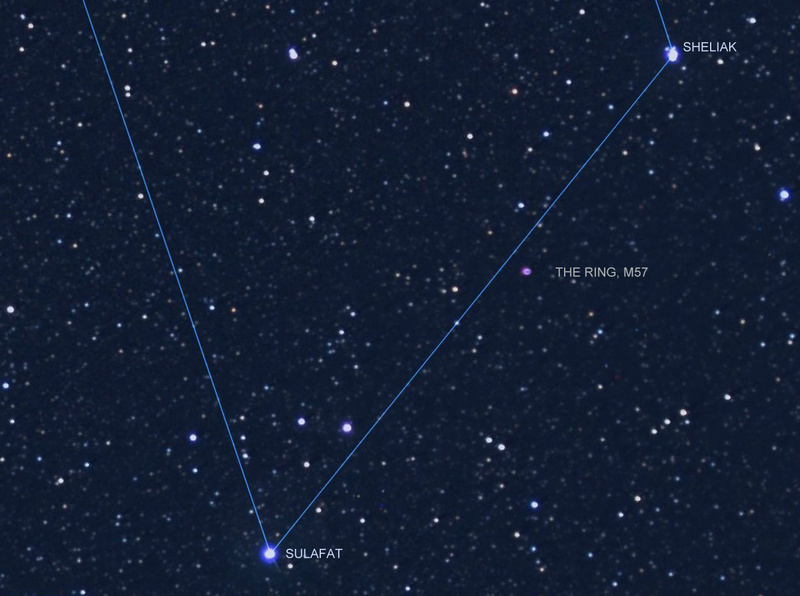 The fainter component, Zeta B, is bluish -green and of magnitude 5.5. binoculars will split the two stars, but a telescope is necessary to bring out the lovely colour contrast. DELTA LYRAE Naked eye pair, Separation 12.5 Minutes of Arc. M57 in Lyra,' THE RING NEBULA', Maybe the finest PLANETARY NEBULA in the entire sky. A 'Planetary Nebula' is the name given to an expanding shell of gas being blown away from the nucleus of a normal star at the 'end of its life'. the star at this stage has become a 'White Dwarf' The name 'planetary' for this type of object was coined by William Herschel who thought their circular shape was reminiscent of the discs of planets when seen through telescopes, under low power. Indeed a 'Planetary' in Hydra NGC 3242 shows a faint flattened ring like the disc of the planet Jupiter. it must be emphasized though that there is absolutely no connection between a planet and a planetary nebula. After becoming a red giant in the far future; this is the fate that lies in store for the Sun It too will shed its expanding atmoshere into space before becoming a white dwarf. 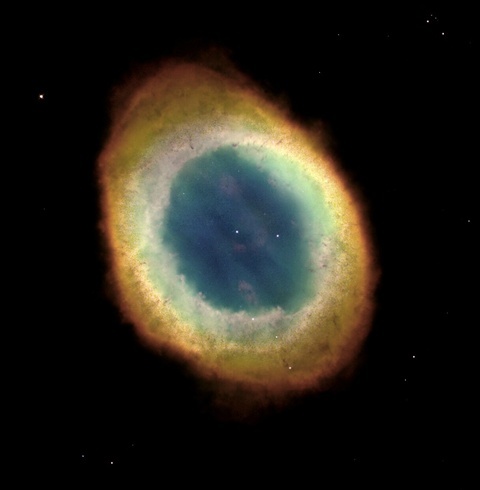 The Ring Nebula in Lyra was the first Planetary to be discovered You will need to use a telescope with at least a 6" mirror to see this faint 'celestial smoke ring'. With larger instruments the reddish fringe becomes visible as do the two stars embedded in the central pale nebulosity which are around magnitude 12. M57 is easy to find lying as it does almost midway between Gamma and Beta Lyrae. (use the diagram below). LYRID METEOR SHOWER. The Lyrid meteors (Shooting Stars) may be seen during April. The peak period is in the early hours of the morning before dawn between April 20th - 23rd. At the time of Maximum, usually in the pre-dawn hours of April 21st & 22nd, some 10 to 15 white, swift moving meteors, leaving streaks, may be seen. It is believed that these tiny fragments which enter our atmosphere at this time, are associated with Thatcher's Comet of 1861. it is interesting to note that records of the Lyrid shower go back to 687 BCE. The radiant (point of origin of the shooting stars) lies to the west of Vega, the constellation's brightest star.